WooCommerce Admin Custom Order Fields Extension: allows you and your team to use WooCommerce as a complete Customer Relationship Management system with centralized order information right in your WooCommerce dashboard,Replace your Customer Relationship Management System (CRM) with this Extension! Streamline your order processing by adding custom order fields. Say goodbye to stickies and endless ‘order notes’! The WooCommerce Admin Custom Order Fields Extension lets streamline order processing for your team by adding custom order fields that are linked to the original WooCommerce order! Want to replace your costly Customer Relationship Management (CRM) software? Can’t because you need your CRM to track order or sales information critical to maintaining your customer relationships? The WooCommerce Admin Custom Order Fields Extension gives you the opportunity to integrate your CRM information into your WooCommerce store. This could mean major savings for your company. 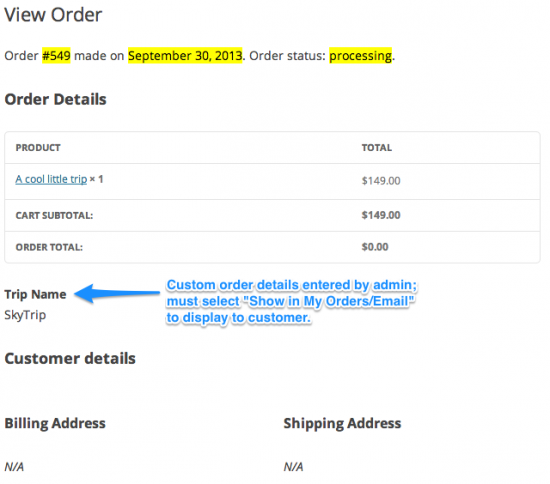 Want customers to see the custom order fields in their “Order Details”? No problem! The WooCommerce Admin Custom Order Fields Extension gives you the option to enable/disable display of custom order fields to your customers. Simply choose “Show in My Orders/Email” attribute for that order field. If you do so. Required: Tells your team to prioritize completing this field before finalizing order by including a red asterisk.